Application of store logos on hangers can add valuable promotional impact at the point of purchase and long after. 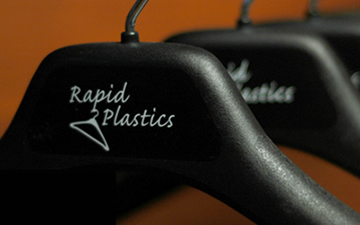 Rapid Plastics offers a variety of hanger decoration systems. Direct Imprinting can be applied with a pad printing machine process at the point of manufacture. Pressure-Sensitive Printed Labels are available from Rapid Plastics. Labels come in single or multiple colors and a variety of diecut label shapes to fit the contours of any hanger. Labels can be pre-applied by Rapid Plastics, or supplied in rolls for application by hand.